WRML.2015-09-24.Reports of resistance are not drench buying guides! The last two WormMails were reports of drench resistance or reduced drench efficacy, relating to ‘Zolvix’ (monepantel) and/or ‘Startect’ (abamectin+derquantel) The first was a statement from Elanco letting the industry know of confirmed resistance of Haemonchus to Zolvix (monepantel) on two commercial sheep farms in the New England region of NSW. I thought the Elanco statement was timely, balanced and put the matter into perspective. I am sure other companies would have done likewise. “Resistance to the older broad-spectrum actives (benzimidazoles, levamisole, macrocyclic lactones) is now quite common on Australian sheep farms. However, confirmed cases of reduced efficacy are still rare for the newer drenches (Startect, Zolvix). Reports of resistance? – what do they mean? Other reports are about resistance surveys. Many of these surveys do not test enough farms to reliably say that the prevalence of resistance of worm A to drench X in region Z is W% of farms. The New England (NSW) Closantel Resistance Survey conducted 15 years or so ago (senior investigator: Dr Joan Lloyd) is one of the few surveys ( that comes to mind) that tested sufficient farms to give a good estimate of the prevalence of resistance in the region. (As an aside: the results of that survey were in the same ballpark of lab data from the former Armidale Regional Veterinary Laboratory (Dept. of Agriculture, NSW). Also the late Dr Peter Greentree, a former Tenterfield District Vet, reliably predicted the prevalence in his district). So, lab data and observations of experienced people in the field may be biased, but sometimes it’s not too bad. Most surveys however give an idea of the likely prevalence, if not robust estimates, which is usually good enough. A recent one is the study published by Playford and others in the Australian Veterinary Journal in 2014. To get the context and full information, read the paper. The results in the table should of course be interpreted with due care. For example, note that for some drench products, there are only a small number of tests. Also, the results summarised in table 1 are Australia wide. In the New England region of New South Wales (NSW), Haemonchus resistant to abamectin, moxidectin and closantel occur on roughly 80+% of farms (generally more than the figures in table 1). Likewise, the table shows that in 30% of tests, Haemonchus was resistant to levamisole. In the New England, however, data from Veterinary Health Research, Armidale suggests around 60% of farms now have Haemonchus resistant to levamisole. Other tables in the paper by Playford and others (2014) show the different results for each state. In short, the situation varies from region to region and from farm to farm, even neighbouring farms. Also, we know from recent tests that Zolvix and Startect are no longer operating at or near high efficacy (say, >98%) 100% of the time. Reduced efficacy is still rare, but it’s there. So, when you look at results such as that displayed in Table 1, what you get is a rough idea of how likely a particular drench active or combinations of actives will be effective. But on your farm, sooner or later you have to test. Either that, of ‘fly in the dark’. The resistance profile of your property may be quite different from what is more or less likely on a more or less average Australian sheep farm. And, given that resistance evolves, you have to keep on monitoring the drenches you use. And, it’s not just about drenches. See ‘Your Program’ at wormboss.com.au . Playford MC, Smith AN, Love S, Besier RB, Kluver P and Bailey JN, 2014. Prevalence and severity of anthelmintic resistance in ovine gastrointestinal nematodes in Australia (2009-2012). Aust Vet J 2014; 92: 64-71. In summer 2014/2015 there were signs of haemonchosis in a sheep flock in the Greater Sydney Local Land Services region, soon after treatment with Zolvix® (monepantel). In August 2015, pre- and post-treatment faecal worm egg counts revealed little reduction in egg counts after drenching with monepantel at the recommended sheep dose rate of 2.5mg/kg. Various anthelmintic drenches were tested with less than 95% reduction in Haemonchus egg counts found for monepantel, abamectin, moxidectin, and a derquantel/abamectin combination. An efficacy greater than 95% was achieved by a four-way combination containing abamectin, albendazole, levamisole and closantel. All tested drenches were highly effective (>98%) against Trichostrongylus sp. Mild to warm temperatures, high humidity and frequent light showers produced a very challenging worm season throughout summer 2014 and autumn 2015 in the Greater Sydney region. Decreased efficacy of monepantel was indicated when routine inspections found signs of haemonchosis after drenching a mob of weaners and moving to pasture adjudged to be ‘low worm-risk’. The climate in the area is generally quite favourable for sheep worms, including free-living stages, which suggests lack of worms in refugia may not have been a significant factor. 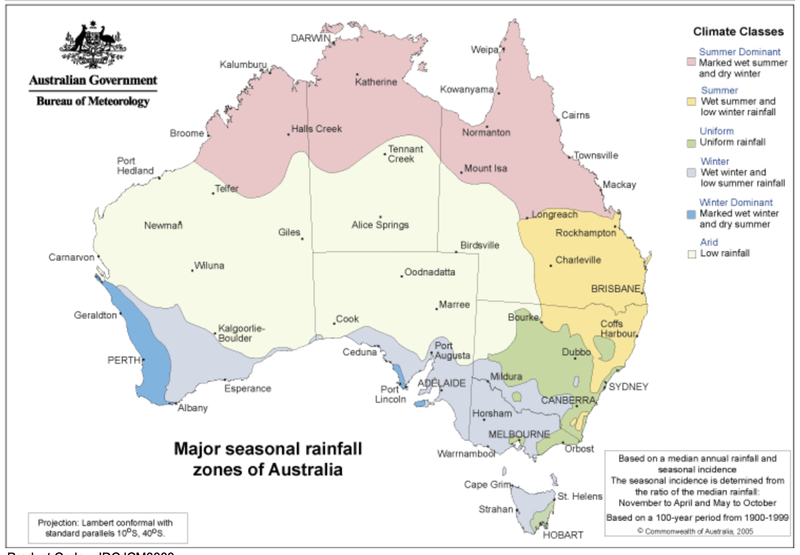 Both median and mean annual rainfall is approximately 770 mm, suggesting rainfall is not highly variable, and mean monthly rainfall ranges from a low of 40mm (July) to 100mm (February). Only July to September averages below 50mm of rainfall per month. The average daily temperature ((max+min)/2) ranges from approximately 23°C in summer to 12°C in mid-winter (July), and is generally only substantially below 15°C in June to August. It’s likely that in average years Haemonchus completes its lifecycle in all months except for four months over winter. Sheep and cattle, but not goats, are grazed on the property. Prior to the initial suspicion of decreased efficacy, monepantel had only been used once a year at shearing (2011-2014) across the entire flock of approximately 1500. Monepantel was also reserved for use as a quarantine drench, however new stock were not brought onto the property during these 4 years. At drenching, sheep were weighed and dosed according to the product label and drench guns were calibrated before use. Faecal egg count reduction tests (FECRTs) were undertaken using the following drenches: abamectin (WSD Abamectin®), moxidectin (Virbac, Cydectin ®), derquantel + abamectin (Zoetis, Startect®), monepantel (Novartis now Elanco, Zolvix®) and a combination drench containing abamectin, albendazole, closantel and levamisole hydrochloride (Jurox, Q-drench®). Fifteen yearling wethers were used in each treatment group, sourced from a single mob, as younger sheep were not available. Each sheep was sampled, weighed and drenched with the dose recommended for 35-40Kg dose. The monepantel recommended dose rate for sheep is 2.5mg/kg. Faeces were homogenised prior to subsampling for faecal worm egg counts (FECs) using the McMaster technique. Double chambers were counted (detection level of 20 eggs per gram faeces (epg)) to determine the FECs at day 0 (the day treatments were given) and 10 days post-treatment. Larval differentiation of a pooled pre-drench culture estimated 63% Haemonchus and 37% Trichostrongylus. Larvae cultured from faeces from each treatment group at Day 10 post-treatment were 100% Haemonchus. The Day 0 and Day 10 FECs and larval differentiations were added to the RESO Excel-based calculator (A Cameron, modified by R Dobson, 2013). RESO calculated the percentage reduction in FECs, and the 95% confidence limits, and generated the resistance statuses seen in Table 1. Table 1. 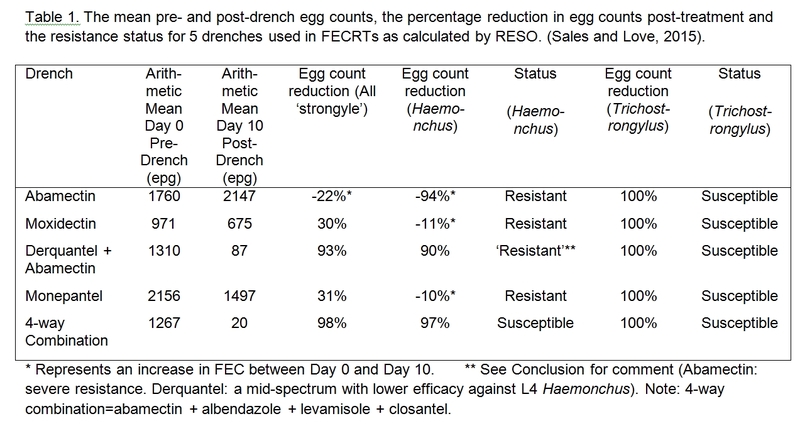 The mean pre- and post-drench egg counts, the percentage reduction in egg counts post-treatment and the resistance status for 5 drenches used in FECRTs as calculated by RESO. * Represents an increase in FEC between Day 0 and Day 10. ** See Conclusion for comment. Note: 4-way combination=abamectin + albendazole + levamisole + closantel. To maintain scientific rigour, a second FECRT was performed as the monepantel drench used in the first FECRT was from a drum that had been opened for approximately 13 months. The label states the product should be used within 12 months of opening. The second FECRT commenced 7 days after the first was completed. Although the product used initially was almost certainly still within the manufacturer’s specifications, a new container was purchased to conduct the second FECRT. The sheep used on this occasion were those that had been treated with either abamectin or moxidectin 17 days earlier during the first FECRT. These 30 sheep were weighed (23-41 kg), sampled and drenched with monepantel at the label-specified dose for 41-50Kg sheep. Eleven sheep, treated with monepantel in the first FECRT, were kept as untreated controls. Larval differentiation on cultures pre- and post-monepantel drench in the second FECRT showed 100% of larvae were Haemonchus. Ten days after the two groups of 15 sheep were drenched with monepantel, the FEC was reduced by 51% in the sheep previously treated with moxidectin, which has a label claim of 14 days persistent activity against susceptible Haemonchus. There was a 29% reduction in egg counts in the sheep previously treated with abamectin, which does not have a claim of persistent activity. At day 10 of the second FECRT the untreated controls, treated 27 days before with monepantel, had a 103% increase in epg. Overall, there was a 36% reduction in Haemonchus epg in the 30 sheep drenched with monepantel in the second FECRT, 17 days after being drenched with abamectin or moxidectin in the first FECRT. In comparison, there was a 10% increase in the Haemonchus epg measured in the first FECRT after a single drench with monepantel. The results from both FECRTs confirm Haemonchus resistance to monepantel. This is an early case of confirmed monepantel resistant sheep worms on a farm in Australia. In this case there was marked resistance of Haemonchus to this drench. Other anthelmintics – moxidectin, abamectin and also the derquantel+abamectin combination – displayed reduced (<95%) efficacy against Haemonchus. The four-way combination, with a FEC reduction of 97%, was effective (>95%) but not highly effective (>98%). The reduced efficacy of the derquantel/abamectin combination against Haemonchus is likely due to the zero efficacy of abamectin against Haemonchus in this case, and the fact that derquantel on its own is not innately highly effective against 4th stage Haemonchus larvae. This is distinct from resistance resulting from a rare genetic mutation allowing worms to survive anthelmintic treatment and increasing in frequency because of continued selection pressure. This is the first case reported in sheep on farm in Australia. Goats were also involved. The location was the James Cook University farm at Townsville, Queensland. In both sheep and goats, reduced efficacy (i.e. resistance) was reported for both Haemonchus contortus and Trichostrongylus. (Constantinoiu C and De Cat S, 2015). Resistance to the older broad-spectrum actives (benzimidazoles, levamisole, macrocyclic lactones) is now quite common on Australian sheep farms. However, confirmed cases of reduced efficacy are still rare for the newer drenches (Startect, Zolvix). As each farm has a different resistance profile, sheep producers should test to determine which drenches are effective and utilize all available options in line with best practice. See WormBoss (wormboss.com.au). Cameron A, ‘Anthelmintic Resistance’: Report of the Working Party for the Animal Health Committee of the SCA. CSIRO, 1989. Constantinoiu C and De Cat S, 2015. Lack of efficacy of monepantel against Haemonchus contortus and Trichostrongylus spp in small ruminants. Proceedings of the 4th AVA/NZVA Pan Pacific Conference, Brisbane, 24-29 May, 2015. Dobson RJ, Hosking BC, Jacobson CL, Cotter JL, Besier RB, Stein PA, Reid SA 2012. 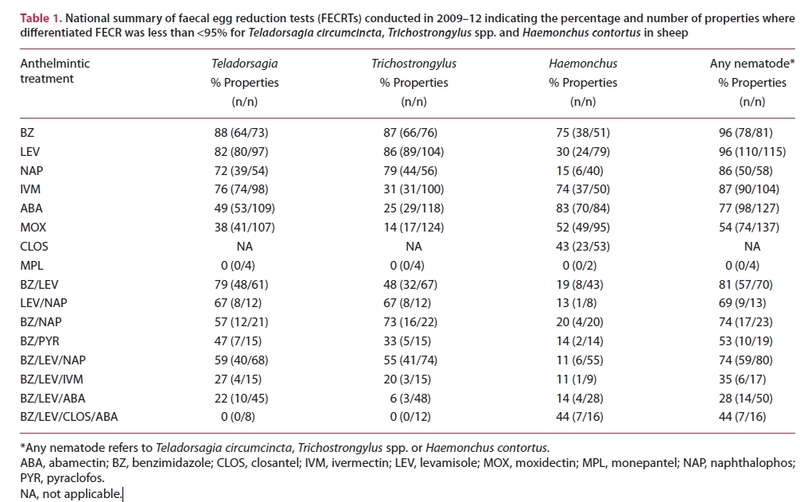 Preserving new anthelmintics: A simple method for estimating faecal egg count reduction test (FECRT) confidence limits when efficacy and/or nematode aggregation is high. Vet. Parasitol. 186:79-93. Love S, 2014. Monepantel (Zolvix®) resistance confirmed in goats in NSW Australia. WormMail Newsletter, 6 June 2014. https://wormmailinthecloud.wordpress.com/2014/06/11/wrml-monepantel-zolvix-resistance-confirmed-in-goats-in-nsw-australia/ Accessed September 2015. Scott I, Pomroy WE, Kenyon PR, Smith G, Adlington B, Moss A. Lack of efficacy of monepantel against Teladorsagia circumcincta and Trichostrongylus colubriformis, Vet Parasitol 2013;198(1-2)166-171. The authors thank Greg Glasgow, Dorothy Sargent and Kim Koeford for their assistance. Elanco has provided the following statement to update the Australian sheep industry on recently confirmed cases of ‘Zolvix’ (monepantel) resistance on two commercial sheep farms in the New England region of NSW. “Elanco Animal Health wishes to notify farmers and industry that two cases of resistance to monepantel (Zolvix®) have been identified on commercial sheep farms in Australia. Both cases are in Haemonchus contortus (Barber’s pole worm) and were identified in the New England region of NSW over recent months. Isolated cases of monepantel resistance have previously been identified in worms of goats and in research institutions, but these are the first cases which Elanco has confirmed of field resistance to monepantel on commercial sheep farms in Australia. Two cases of resistance to Zolvix® (monepantel) have been identified on commercial sheep farms in Australia.  Both farms are closely situated geographically in the New England region of NSW.  The resistant worm species on each farm was Haemonchus contortus (Barber’s pole worm).  To date, there has been no monepantel resistance identified in scour worms (e.g. Trichostrongylus or Teladorsagia (Ostertagia)) on commercial sheep farms in Australia.  It is important to note that resistance may develop to any drench active.  Zolvix remains a highly effective broad spectrum sheep drench for the vast majority of commercial sheep farms in Australia. As is well known, the New England region is a summer-dominant rainfall environment where Haemonchus contortus is endemic. There can be very heavy reliance on anthelmintics in this environment, particularly in the absence of effective grazing management and other integrated parasite management strategies. Severe drench resistance to the older drench classes is common. In the two confirmed cases, there was resistance demonstrated to all broad spectrum drench classes. Ultimately we know that resistance may develop to any drench active. Over time, it may be expected that further cases of resistance to monepantel may emerge where there is extended or heavy reliance on the active – particularly where there are additional contributory environmental factors. However, we do not know the rate at which any further cases of resistance may develop. In other worm species however (e.g. scour worms), development of resistance may reasonably be expected to be slower, due to the lower selection pressure applied.  It is very important not to wait until all other drench classes are ineffective before integrating new drenches. Spring often means there are a lot of worm larvae – roundworms and fluke – on pasture, or at least they are there in increasing numbers. A week or so before lamb-marking, consider getting some fresh ewe and lamb poo samples off pasture for a worm egg count (WEC). Ewes and lambs generally don’t need a drench at marking, unless it has been a very wet year, lambing paddock preparation wasn’t so good, or the pre-lambing drench wasn’t effective. Cattle drenched at weaning in late autumn might need another drench in Spring. This varies a lot between farms and regions. In dry areas, no routine drenching is required at all! Do worm egg counts (WECs), but don’t just rely on them in cattle. Sometimes they are a poor guide. Consider growth rates as well. If in doubt, do a ‘diagnostic drench’ on a small number of animals in the mob, and measure the response. If weaner cattle are held over until 15-18 months of age (summer/autumn), do a drench when they reach that age, mainly to manage type 2 (inhibited) Ostertagia (brown stomach worm).This drench should contain a ‘mectin’ (macrocyclic lactone (ML)), or, even better, a combination drench containing a mectin and one or two other unrelated actives. Most importantly, use the drenches that you have tested and know work on your place. Drench-resistant worms are not just an issue for sheep, goats and alpacas. Livestock may need another liver fluke drench in early Spring. But for many, one fluke drench a year – in April/May, the single most important time to drench for liver fluke -will suffice. Seriously ‘flukey’ properties might need three, the 3rd fluke drench being in summer. Use the most effective flukicides at the April/May drench. When you drench, make it a regular practice to do a ‘DrenchCheck ‘: a WEC on or just before the day of drenching, and another 10 days (sheep) or 14 days (cattle) later. Don’t just monitor the older drenches; check the new ones (Zolvix (monepantel), Startect (derquantel+abamectin)) as well. Assume nothing. If checking a fluke drench, do a Fluke WEC on the day of drenching, and another 21-28 days later (all livestock species). Or you can do a ‘faecal fluke antigen test’, available at the vet lab at Charles Sturt Uni at Wagga. Stomach fluke could be an issue for young cattle on swampy areas in some coastal areas. It rarely is an issue elsewhere. Get local advice. Start thinking about preparing paddocks for weaner sheep. See Your Program in WormBoss for more information. Watercress it seems is the latest super-food. “This is a good article, but there should be a warning about harvesting watercress from rivers/streams because of the risk of contracting liver fluke. This is also the sort of place where the infective stages (metacercariae) of liver fluke (Fasciola hepatica) encyst on herbage, including wild-growing watercress. There are cases of humans being infected by this means, e.g. collecting wild growing watercress on farms which have liver fluke. Because the infective stages encyst – i.e. glued onto – herbage, they don’t easily wash off. Liver fluke most commonly infects grazing livestock, but can infect a wide range of animals, including humans. In the past, human cases of fasciolosis, as with cases of trichostrongylosis, haven’t always been rapidly and accurately diagnosed. And sometimes inappropriate anthelmintics have been used. Things might be much better now. What do you know about Linguatula, aka tongue ‘worm’? Is it actually a worm? Is it found in the noses of: (a) wild dogs (b) fairy penguins (c) nosey parasitologists (d) the tongues of drop bears? Is it: (a) common (b) very common (c) doesn’t’ exist – it’s a practical joke ? (Thanks for the heads up, Dr Roth). OK, WormBoss was first cab off the rank (2005, revamped in 2012 (21-11-12)), but there are other Bosses under the Paraboss ‘parasol’ as well: FlyBoss and LiceBoss. Like WormBoss, they are the place to go for information on management of sheep parasites in Australia. The Northern Tablelands Local Land Service has its own app! (Thanks for the heads up, Dr Biddle). Go to Your Program and, in one of the tables at the end, there is information on the effects of various temperatures on worm egg hatchability and larval survivability. This information is of enormous practical value. It will help you decide if and when you can put sheep back into the lambing paddock pre-lambing, without adding significantly to ‘worminess’ of the paddock. And it will guide you regarding appropriate times to keep sheep out of paddocks – in order to reduce worm-risk – at different times of the year. If the nearest BOM weather station isn’t really representative of your property, you might consider measuring your own data. Or you might like to anyway. Refugia – a recent fad? Note that this paper is to a large extent from the perspective of a winter rainfall region (Victoria/South Australia). For example, regarding Haemonchus, which is more prevalent in summer rainfall areas, notably northern NSW and Queensland, Carmichael states “This blood-sucking parasite of the C3 stomach was not found in the surveys of Carmichael (1999) or Presidente (2003)”. It’s best to read the whole paper for yourself, but following are some key messages. (As with sheep, haemonchosis can occur in alpacas from time to time, when conditions are favourable – e.g. unusually wet summers – in alpacas in regions other than summer rainfall areas, but somewhat less often. – S.L. (Ed.)). See also information on liver fluke at WormBoss and NSW DPI. “There is a very clear age resistance to internal parasites. Supplementary feed should be provided in troughs rather than on the ground. In the final section, Carmichael discusses worm egg counts, drenching, drenches, drench resistance and quarantine of purchased animals. Carmichael discusses moxidectin (Cydectin etc) and monepantel (Zolvix) as two drenches most likely to be effective in alpacas, suggesting 2 times the sheep dose rate, but see the evidence adduced by Dadak and others who, regarding monepantel, opt for 3 times the sheep dose rate, in llamas at least. As these are off-label uses, consult your veterinarian on the use of these and other drenches, including aspects such as safety, efficacy, withholding periods/residues, and resistance management. Be aware also that resistance is very common, including an increasing prevalence of resistance of Haemonchus to the macrocyclic lactone class, of which moxidectin is a member. Do regular DrenchChecks as well as regular WormTesting, as advised in WormBoss. Deb Maxwell, ParaBoss Operations Manager, has written a new article on Barbervax. ParaBoss is the umbrella (parasol if you like) under which WormBoss, FlyBoss and LiceBoss sit. ‘Refugia’ – a recent ‘fad’? van Wyk JA: Refugia- overlooked as perhaps the most potent factor concerning the development of anthelmintic resistance. Onderspoort J Vet Res 2001, 66:55-67. Published on Aug 12, 2015. ‘A practical guide to using http://www.RamSelect.com.au to ensure you maximise value when selecting rams that meet your breeding objectives’. There are of course Australian texts on plants poisonous to animals, for example the one by Selwyn Everist, but there are more recent texts. Whats the deal with cobalt and horses?